Southpaw Harry Blitman, the North Philly featherweight, faced South Philadelphian Lew Massey for the second time, on this day in 1931. This cross-town rivalry played out over three fights at the Philadelphia Arena. 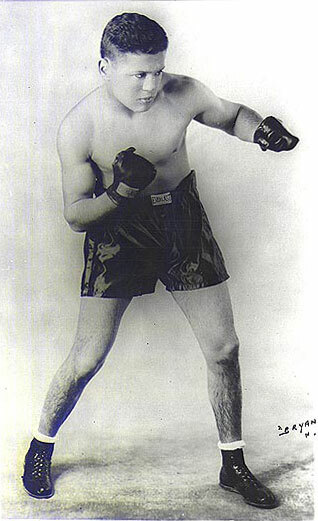 The first meeting pitted the more experienced Blitman, who had beaten Tony Canzoneri in a non-title fight, against the relatively green Massey, in November of 1929. In a surprise, Massey lowered the boom on Harry in round two. It was the first of only 14 KOs he would score in his 12-year career. By the time they fought for the second time, Massey had built on his win over Blitman, adding several big names to his resume. He entered this rematch with a 44-5-4 record, while Blitman's log read 55-4-1. Avenging his prior loss, Blitman took the re-do by 10-round decision, setting up a third fight. The rubber-match occurred on April 27, 1931, again at the Philadelphia Arena. This time Lew Massey out maneuvered Blitman over the ten round distance to break their tie. Blitman fought for another three years, ending with a 61-10-3 record. Massey ran to 81-34-8 and fought for seven more years.